This soup is a family favorite! Feel free to cook your own rice, but the pre-cooked package reduces your prep time considerably. 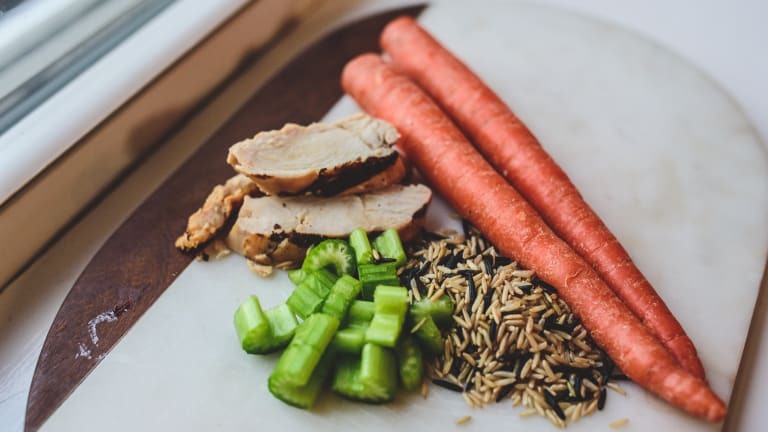 If you cannot find wild rice in your region, you can substitute any rice blend. Paleo: Use riced broccoli instead of rice, tapioca flour instead of all-purpose flour, full-fat coconut milk instead of half and half, and ghee instead of butter. Vegetarian: Use 1/2 cup frozen corn (thawed) and 1/2 cup frozen peas (thawed) instead of chicken. In a large Dutch oven or soup kettle, sauté the onions, carrot and celery in butter for about 8 minutes, until almost tender. Stir in flour until blended. Gradually add broth. Bring to a boil; cook and stir for 2 minutes or until thickened. Reduce heat. Add the chicken, pepper, salt, thyme, and wild rice. Cover and simmer for 5-10 minutes or until vegetables are tender. Reduce heat. Add half-and-half and heat through (do not boil).